Hi.Since I got the car, I have had the TCS LIGHT illuminated (lit on the dash meaning the car has disabled it). No matter what I do it will not re-engage. No other lights or issues. i.e. everything else is perfect. I have read that C1295 is stop light switch circuit open. 1) I know I am supposed to have voltage to the brake lights when the car is in the ON position (not running) brake pedal NOT depressed. The rear 3057 and 194 bulbs light up with the brake pedal NOT depressed. My question is should the 3rd brake light, LED light up also? I am not getting voltage to that while in this state. If I push on the brake pedal, I get voltage to the 3rd brake light LED and it all illuminates. Is that correct? I have replace the brake switch with a new one. No resolution. I have also changed out the traction control switch with another one that I know is good. No resolution. Does anyone have any suggestions on next steps? Also if anyone has a complete wiring diagram for the brake switch circuit that would be very helpful. You sign up now and they verify your address, and send you a link to use to log in to use TSBs or electrical diagrams. I couldn't figure out how to upload the pdf I have on my computer of the brake light circuit. Thank you Jeff! Appreciate the help and the post!!! Hello Everyone. Still chasing this TRAC LIGHT on my Dash. I have obtained a Snap On Ethos scanner. It shows the status of the Brake switch and the brake lamps. When I push on the brake pedal It does not change on the scanner from OFF to ON. Also it says the Brake lights are not coming on however they are. I am confused here. I put this scanner on my 2004 Grand Am and when I press the brake pedal it does move from OFF to ON on the scanner display for the brake switch. It also says the brake lamps are coming on. I had replaced the brake switch with one from autozone and no change. Wondering if I should get an AC DELCO. I just am not seeing any other issues and guessing it is something in that circuit. All wiring looks good to me, I have cleaned all contacts. Any additional suggestions would be appreciated as I am stalled with ideas short of trying another brake switch. I'm very confused. When you press on the brake pedal, what happens? 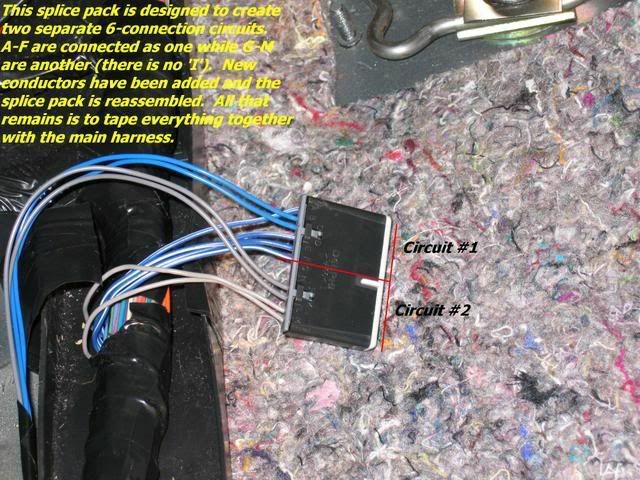 Have you installed wiring for a trailer, or was it done before you purchased the car? If so, it's a bad conversion box. The only light on is for the Traction Control? If it's combined with ABS light, you have a bad wheel speed sensor. Turn on your headlights and have someone watch while you press the brake pedal and see what happens. The 3057 bulb has 2 elements. one is for tail lights, and the other is for brake lights. One element only works when you press the brake pedal. So, with the lights turned on, when you press the brake pedal, the light gets brighter. Hi!. Sorry for confusion. I will try to answer your questions. No extra wiring, aftermarket anything. Bought from original owner who was elderly. All stop lamp bulbs. 100%. Have checked both filaments. even the small 194 lamps in the back, perfect. If I turn on lamps the 1st filament lights up. If I push the brake pedal the second filament in the 3057 lights up. The only light on the dash is TRAC OFF (which is on). No ABS, etc. i.e. everything works 100% except the TRAC OFF light is on the dash. The scanner shows a C1295 open brake switch circuit and that is the confusion. I cannot find any open. The only hint I have at this point is when I push the brake pedal, the ethos scanner does not show it changing status from off to on like my grand am. I know there are 2 switches near the brake pedal. One is for the brake switch and apparently the other is for the cruise control (which works perfectly). I read a blurb that the cruise control is part of the brake circuit (to stop cruise when engaged). My only last guess is perhaps something is wrong with that cruise control switch but I cannot see how if the cruise works 100% (when engaged if I push the brake pedal it stops cruise). Have you ever had problems with water/moisture under the carpet? This is a very common problem with these cars. There is a signal that goes from the rear fuse block 'STOP LP' fuse to the EBCM. It passes through the Stop Lamp/Auto Trans Shift Lock Control Switch and a splice pack that is located in the main body wiring harness just to the left of the driver's seat. There have been reported problems with this splice pack (and another splice for the door modules located close to this). Given the problems with water intrusion into these cars, this splice pack is probably one of the first places I'd look for corrosion and problems. An open in this circuit sets DTC C1295. Problem is, you'll need to remove the driver's seat to get underneath the carpet to access this. The particular splice pack in question has both white and yellow wires connected to it. These are completely different circuits as this splice pack is split (meaning there are two halves, not connected to each other). Whatever you do, if this needs to be replaced/repaired, do not connect all the white and yellow wires together. I'll try and post a picture of the splice pack so you know what to look for. It will be part of the harness with tape wrapped all around it. Thank You Resident Gearhead! Yes I had very bad water problems. As a matter of fact, when I got the car the door panel plastic covers all leaked, the sunroof drain holes were clogged and the cabin air filter leaked water. It was like a pool in there when I got it! All water issues have been fixed. So are you saying I should look for corrosion or issues on that wire pack? I will take out the drivers seat at some point and take a look because I am completely out of ideas on what the problem could be. Any other info you may have in that are I would appreciate. Otherwise I will look down that way to see if that can rectify the situation. So are you saying I should look for corrosion or issues on that wire pack? It's in the "Interior" section and is titled "Passenger front and both rear door windows & locks don’t work". May as well tackle both at the same time (if you haven't already fixed this one). I'm interested in hearing back about what you find. Not a bad thought, but the traction control reverts to 'On' with each ignition cycle. Knowing how the traction control switch is made, and given the associated wiring is isolated to the instrument panel harness (with the exception of the ground), a switch or wiring fault here is unlikely. 2000 Pontiac bonneville ssei question! !